On a beautiful late spring afternoon, this past year, a young woman received some devastating news. She had just gotten back her National Evaluation Systems (NES) Music test result. It was not what she had hoped for. In fact, it was not even close to her expectations despite her past experience and educational background. Unfortunately, this hypothetical situation occurs all the time. Someone thought they were going to breeze through the examination, told all their friends, made plans for their future, and then got an embarrassing reality check from the NES Music Exam. The National Evaluation Series (NES) Music Exam is quite simply an objective assessment of a test taker's requisite foundation of knowledge and skills. NES Music Exam scores are used by the National Evaluation Systems (NES) as a uniform standard of qualification. While it may not be fair, all of a person's plans for the future may be dependent upon needing a certain NES Music Exam score. That is the whole purpose of our NES Music Secrets study guide: to give test takers the keys to understand how to succeed on the NES Music Exam. If you'd like to get the NES Music Exam score you deserve, to quit worrying about whether your NES Music Exam score is good enough, and to beat the test taking game, then this might be the most important message you read this year. Our comprehensive NES Music Exam study guide is written by our exam experts, who painstakingly researched every topic and concept you need to know to pass your NES Music Exam. Our original research into the National Evaluation Series (NES) Music Exam, offered by the National Evaluation Systems (NES), reveals specific content areas and skills that are critical for you to know on the NES Music Exam. We've taken that information and developed a study guide that is guaranteed to help you be successful on the NES Music Exam. #1) Our name is Mometrix Test Preparation, and we have an entire team of researchers who do nothing but study and "reverse engineer" standardized tests like the NES Music Exam. We maintain very strict hiring standards for this team of researchers, and very few applicants for the rare open position come close to qualifying, as we set a very high bar for quality when it comes to our study guides and other materials. You can rely on their combined decades of experience in cracking the code for difficult standardized tests such as the NES Music Exam to get that all important passing score. #2) Most people simply aren't very good at preparing for tests; in fact, many badly overestimate how prepared they are for a major exam, even highly intelligent people. This has been proven in several academic studies, but it's not the fault of the students. It's the result of relying on ineffective and outdated study methods. But our experts here at Mometrix decided there had to be much better ways of preparing for exams. We just had to discover them. We're convinced that we've done just that; we've found the secrets to beating these exams. We were surprised at what we found; some of the keys to getting a high score were unbelievably simple to implement once test takers found out about them. We've put all the results of our research together in a compact, yet thorough, study guide that will allow anyone, no matter their present skill level, to see dramatically improved results with very little effort. #3) Part of our motivation in creating NES Music Secrets was our frustration at the lack of quality test prep tools for the NES Music Exam. Future teachers looking for help with the NES Music Exam really had no good options. Most of what was available made the same fundamental error: it tried to teach the subject matter, instead of focusing on teaching the test. This doesn't work, because most of the people who will take the NES Music Exam already have a pretty good grasp of what they need to know about teaching; it's the nature of the test that trips them up. Test takers who do well on the NES Music Exam do so because they understand the link between their knowledge of their subject, and how to use that knowledge in the context of the NES test format. That's what makes NES Music Secrets so powerful. We show you how to take the material you already know, and successfully apply it to the actual NES test format. How to overcome one of your biggest obstacles: time limits. You'll learn how to dodge hidden time traps, putting you far ahead of the average uninformed test taker. Super-fast techniques of breezing through the many easy questions, so you can spend more of your valuable time on the harder ones, without ever being in a hurry. Get fast answers for any questions you might have about how to use our materials. Just send us an email and one of our team will get back to you ASAP. Get the EXACT NES EXAM STUDY PLAN that gives the most powerful results in the shortest amount of time; avoid spending your valuable time on tasks and activities that don't pay off. Our research team members aren't a bunch of nerds; they're experts on both the formats of standardized tests, as well as being experts on test taking, so you'll gain the information and skills you need to do your best when it really counts: on test day. Why you don't need to guess about guessing when you're stumped. Learn when you should guess, how to do it, and how to maximize your odds and avoid the faulty strategies that lead so many others astray. There are little known tipoffs that reveal the right answer for many questions; learn how to spot these telltale giveaways and ramp up your score. How to lay the groundwork right away for a powerful and efficient test prep plan that you can get started on immediately. How to interpret test questions so you'll know exactly what answer they're looking for, instead of wasting time wracking your brain trying to figure it out. A little known method for beating some of the most difficult questions you'll face, allowing you to save a ton of time. Exceptional customer service! Need to ship or email to a different address? Lost your study guide? Having any other problems? No worries; just email us and we'll take care of it right away, even on weekends. You won't be getting a bunch of rehashed material; our experts' research is 100% original and independent. Our calibration strategy, which you'll only find here, makes sure you don't go too slow OR too fast, so you maximize your efficiency. Our original and exclusive 5-step phased approach will show you how to get the most out of practice tests and other study aids. Find out why many answer choices that sound right are wrong, and how to tell the difference between the right-sounding wrong answer, and the correct answer. The benchmark tip for choosing between two or more answers that are very similar. How seemingly random information in a question is often the key that lets you answer it correctly. How to tease out clues to the right answer when you run across the rare question that leaves you completely stumped. Our very own method to create your own lifeline when you're tempted to panic over a question that appears to be over your head. Learn an easy and fast brainstorming trick that lets you quickly dissect a question and find helpful clues you previously overlooked. Learn how to quickly spot weasel words and fudge phrases that can tip you off to the right answer. Contextual clues in questions and answers that can help you choose the correct response. An unbelievably simple tip that will let you perform a fast double check that saves you from making mistakes, but doesn't take much time. What extreme statements are, how to spot them, and what they almost always mean when it comes to choosing the correct answer. How to separate the possible answer choices of tough questions into families, so you can quickly rule out one or more choices and boost your odds of answering correctly. Now, those are some big promises. Can we really deliver on them? First, let us make it crystal clear what NES Music Secrets isn't. It is NOT a warmed over collection of common knowledge study tips and things you're already aware of. On the contrary, NES Music Secrets is a volume of techniques and knowledge that we've compiled specifically to help you pass the NES Music Exam with as little study time as possible. It's written in plain English and is very user friendly. We teach you the essential skills you'll need for success on the NES Music test, and we include a thorough review of the specific NES Music test you'll be taking. One: The people who wrote it must be professionals who have exhaustively studied the concepts and topics found on the NES Music Exam if you're going to be successful. Two: Even though it was authored by professionals, it must be written in plain, easily understandable language that all test takers can relate to. Three: It should be fluff free; direct and to the point, so you don't waste time or get distracted. Four: It should focus primarily on the NES Music Exam itself, and only secondarily on the subject matter. As we pointed out earlier, if knowing the material was all that mattered, we wouldn't see so many people with high grades from excellent education programs failing the NES Music Exam. Simply knowing the material doesn't mean a person will be able to succeed on the NES Music Exam, as these are two different skills. A good study guide should bridge the gap between them. Six: It must come with a money back guarantee. Anyone who doesn't pass the NES Music Exam should get their money back. Period. You'll receive more than 10 times your money's worth! When you add up the costs of failing the NES Music Exam- retesting fees, a minimum of a few months' salary missed out on, etc., and then compare the total to the small price of NES Music Secrets, you'll see you're easily getting more than 10 times your money's worth in value. along with many more secrets and tips we're including to make sure you pass the NES Music test. NES Music Practice Test Questions: Are you ready to tackle the NES Music Exam? Take our practice test questions and find out if you're fully prepared, or if you need to put in some more prep time. These questions offer a great way to make sure you don't face a very unpleasant surprise come test day! These NES Music practice exam questions allow you to put your knowledge to a real test, before you take the actual exam. Review and repetition are key to success; using these practice questions will reinforce your strengths while helping you identify and brush up on weak areas. Don't worry; we don't just give you the correct answer and leave it at that. We also provide in depth explanations as to why each correct answer is right, and some insights into the most common mistakes people make that lead to the wrong answers. These detailed answer keys are vital to your success when it comes to passing the NES Music Exam. When you receive Study Skills, you'll truly have the inside scoop on how to study effectively, so you get the most out of the time you spend preparing for the NES Music Exam. You won't find a more comprehensive study manual than Study Skills, and you get it for free when your order. And don't forget; we guarantee you'll pass the NES Music Exam with these techniques, or you get you money back, no questions asked! How to Overcome Test Anxiety: Do you get a terrible case of nerves when a big test is coming up? You might be suffering from test anxiety, which is a common problem. This bonus report provides you with the results of some of the cutting edge research on the topic of test anxiety, and you'll also get our exclusive recommendations on what you can do to relieve your stress, so you can relax and get a high NES Music Exam score. Preparing to Teach: Sure, you learned a lot while getting your education degree, and from your student teaching days, but there's still a lot you haven't been told when it comes to leading a classroom. Our bonus report will provide lots of information and suggestions to help you become the best teacher you can be. Financial Advice You Won't Want to Miss: Obviously, you're not going into teaching to get rich, which means it's even more important to make the most of the salary you earn. Our report delivers some straight talk about finances that can keep you from wondering where your paycheck went, and help you build a solid financial foundation in life, and possibly retire years ahead of schedule. Written Assignments for Problem Situations: Your students will find all kinds of different ways to act out and misbehave, and you'll want to have a plan in place to handle each situation. Our written assignments are a great tool you can use any time a student gets an attitude, or is disruptive in your classroom. You'll get your point across and cut down on future disruptions, too. How to Eliminate the Blame Game: "Don't blame me! It's not my fault! " You're no doubt familiar with these excuses from your student teaching days, and once you go full time, you'll be hearing them, and many more excuses, on a regular basis. With this report in hand, you'll be able to eliminate the vast majority of excuses the average teacher hears from both parents and students. Don't find yourself up against the wall; getting rid of the blame game is much easier than you think. How to Handle Special Events: Thanksgiving, Christmas, Halloween, last day of the school year parties... there's no end to the holidays, special events and occasions that come up every school year. Rely on this free bonus for some great ideas for turning these special days into truly memorable events for your students. With our help, you won't need to be naturally creative to throw parties that will make your classroom the envy of the entire school. Learn how to take any troublemaker student and win them over to your side. Even the wildest child will be like putty in your hands. Teaching Secrets was authored by a veteran teacher who spent over 30 years in the classroom. Her insights and humor will have you both learning and laughing as you read. Teaching Secrets usually sells for $29.95, but you get it absolutely free with your purchase of NES Music Secrets. We want to make sure you pass the NES Music Exam, so we insist on taking all the risk when you order NES Music Secrets. Our 1 year 100% Money Back Guarantee means that you have absolutely ZERO RISK when you purchase your guide from this site. Why do we have such a generous policy? Because we know how good NES Music Secrets is, and how much it can help you when it comes to passing the NES Music Exam. We're convinced that once you have it in your hands, and see the high quality of the guide for yourself, the last thing you'll want to do is send it back. But we know that some people might still have some doubts, so we're going the extra mile to make absolutely sure no one has any cause for concern. So order your very own copy of NES Music Secrets today. Take plenty of time to read through it, use it, and rely on it to pass the NES Music Exam. You've got an entire year to claim your refund, so there's no rush. 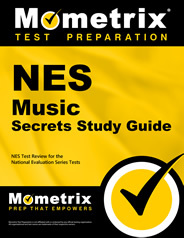 If NES Music Secrets doesn't help you get a passing score on the NES Music Exam, just let us know by email at support@mometrix.com, and we'll be happy to issue you a refund for 100% of the product price. But our guarantee doesn't stop there. If you're not happy with NES Music Secrets for ANY reason whatsoever, you get your money back, no questions asked. Again, this is good for an entire year; you can return it for any reason, at any time, for 365 days after the day you purchased it, and you'll get a no hassle refund. We've simply had it up to here with smart, hardworking people missing out on opportunities only because of the score they received on the NES Music Exam. A great score on the NES Music Exam leads to a wonderful future, changing kids' lives in classrooms. But a person who comes up just a little short on the test will find their hopes and dreams dashed, possibly forever. We think that's terribly unfair, and we don't want to see it happen to anybody. If you believe there's even the slightest chance that NES Music Secrets will help, then you can't afford to miss out on it. Doubts or fears shouldn't prevent you from taking the step that could make your dreams of a teaching career come true. In other words, there's no need to decide right now if NES Music Secrets is right for you. You've got an entire year to make up your mind. So order it from this site today, and give it a try. If it isn't everything we promised above (and more), if it doesn't save you a lot of frustration, money and time, if you're disappointed with it in any way, or you don't believe it's going to help you achieve a passing score on the NES Music Exam, there's nothing to worry about. Just let us know, and you'll get your money back under our 100% ironclad money back guarantee. You've got nothing to lose, and a wonderful future to gain. Order NES Music Secrets directly from this page. Printed copies almost always ship within one business day from our central facility. Don't want to wait a few days for a printed copy? No problem; order the ebook version, which you can download instantly. You don't need to install any software to read it, either. If you're able to read this web page, then you're good to go, and you can be reading and benefiting from NES Music Secrets in just minutes, without having to wait on the mailman. Download NES Music Secrets right now! The price is the same for either version. If you enjoy ebooks and want your book instantly, order that version. If you prefer traditional print books, and don't mind waiting a few days, order the printed version. Ordering NES Music Secrets is easy. These comprehensive packages retail for $72.99 or more, but are available to you today starting at the incredibly low price of $39.99. Just click one of the links below. If you would like to order through the mail, click here to order NES Music Secrets study guide by check or money order.